The day started off pretty bad. Not from an autograph standpoint, but from a parking standpoint, and that there was none at 6 different train stations. After freaking out in my car for way too long, I decided to just drive to Queens and park at my friend’s house. It was annoying as heck, but whatever it needed to be done or I was not going to be able to get into the city. We ended up making it to the hotel at 11:15 which is a lot later than I like to get there, and as a result I missed Jarrod Saltalamacchia, Mike Maddux, and Marlon Byrd. That was disappointing but sometimes that happens and there is nothing you can do. The first player we did see was Jason Jennings. The 2002 NL ROY just stood outside the hotel waiting for friends and signed whatever you put in front of him. When all was said and done I had gotten 10 cards signed, including a 2007 Allen and Ginter when he was on Houston. After that the next player out was Francisco who got into a car and signed while sitting down. 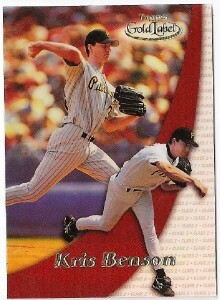 I had 6 cards of him, they were all the same, but they are the very nice 2004 SP Prospects cards. You can see the signed one below. Its very red. While I was putting his card away someone said that David Murphy was signing. So I got my stuff out for him. But then I noticed Ian Kinsler. So I ditched Murphy and headed over to get Kinsler. Ian was cool and waited for me to get my cards out, and signed 3 for me. Then total chaos set in. There were 7 players standing there. Next I went up to Chris Davis. Chris signed all 5 cards I brought for him, and then it was over to Elvis Andrus, who signed one for me. After that Matt Harrison, who was with the team dispite being on the DL signed 2 for me, and then Taylor Teagarden signed the lone card I had and Brandon Boggs signed one of the 6 I had. They all then got into cabs and headed off. But just as quickly as it started there was a moment to catch my breath and notice that I quickly grabbed 13 autographs in about 5 minutes. A few minutes later we saw Warner Madrigal who signed the lone card I had. He has since been sent down. Eddie Guardado had left for lunch before and returned and started signing. When he was done signing I had 8 cards signed, suprisingly none of which from his Minnesota days, where he made his name as a closer and earned the nickname “Everyday Eddie” Weird, but it doesnt really matter to me. The last guy we got pregame was Kris Benson who got on the bus. I had 3 really nice cards signed, and he has a gorgeous signature, but he signs very fast and uses the side of the marker so they didnt come out great. He did one of the gold label and 2 of the SP cards. I had 37 autographs at this point and I was going to stay for postgame. I hung out in NYC with my friend Vincent and we walked around a little before meeting up with my friend Russ, who is living in the city this summer. We watched a bit of the game, but mainly the hockey game. Finally the game ended and we headed back over to the hotel. There were two buses, and off the first one I got Hank Blalock to sign that sideways card, which was a 2007 SP Rookie Edition card. First time I have gotten one of those signed, and it looks great. Then Andruw Jones came back in a car. I asked him to sign a Braves and a Dodgers card. Now, I know your thinking, a Dodgers card? Really? He sucked that year. Well he did, but when it’s an Allen and Ginter, that takes priority. He agreed to do that and yet signed 2 Dodgers cards anyway. Great. At least he did a Ginter and a Co-Signers. The last guy we would get that night would be Omar Vizquel. Omar came back in a taxi, and when we went to get him he went out the other side of the taxi and started playing with us. He ducked down behind the cab and started pretending to be chased. He stopped and was laughing and signed two for me, a Mariners card from 1990, and an Indians card from 2000. That was it, I drove home, and watched MLB Bloopers on MLBTV. I was at the Rays hotel Friday, June 5 and did very well. I may go back tomorrow for postgame, and most likely on Monday for the last hotel for a few weeks and do Tampa until 3:30/4 and then go for Philadelphia after that since they will be in town. As always there will be updates for everything. Why do you sound so hurt when played will not sign for you? They do not owe you or any of us an autograph. Running after players while they’re in Starbucks, is that really necessary? Maybe you’ve been hanging around Vincent too long, who is close to ruining every autograph opportunity in the city. im not “hurt” when a player doesnt sign for me. sure they do not “owe” anyone an autograph, but considering these guys get paid millions and millions of dollars to play, and when you consider where that money comes from, they should take a few minutes out of their days to sign. im not saying that they have to, im just saying they should. if it werent for you and me and the millions of other people paying for tickets and shirts and hats, memorabilia, cards, photos, whatever it is all that makes it way back to the teams to pay their players. and point out when i “ran after” a player in Starbucks. If you want to blame anyone for ruining autograph opportunities you can blame the people who hang out inside the hotel, something you should know about. WHAT HOTEL DID THE RANGERS STAY AT ? Wow, how weird that you play baseball, and not bother signing a fan an autograph, what kind of an Idol are you not to help a fan out? Anyways nice job!